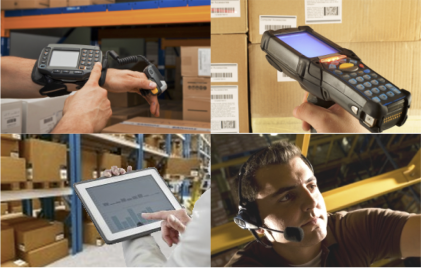 Mobility Platform is an innovative solution helping customers to accelerate the process of mobile enabling their supply chain and warehousing operation, without the need to compromise their unique practice and replacing existing system. Time-to-Market Mobile Enablement. The unique architecture helps customers to build mobile enabled operations in a fractional effort without replacing existing system, while retaining flexibility to adapt to future changes. Support Omni-Device Operation. The multi-touch technology helps customer to increase device utilisation by delivering the same functionality onto different types of mobile device such as RF handheld scanner, Vocollect talkman, smartphone and tablet. Reduce Cost of Ownership. 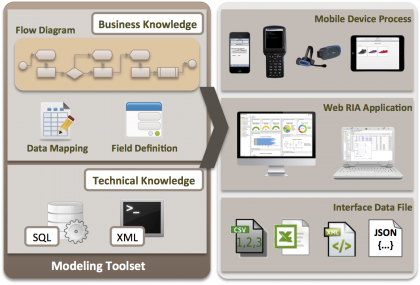 The adaptable modelling framework accelerates mobile development process and eliminates the need for specialised and device specific development skills to maintain and fulfill on-going demand. If any of following best describe your current situation when it comes to supply chain and warehousing mobile enablement, TALK TO US, Mobility Platform could be the answer to your mobile enablement strategy. We want to introduce RF or Voice-based solution to increase operational efficiency, but we do not want to replace our current system. Our current RF or Voice solutions are too rigid and not operational friendly, we are not able to create new functionality or make any change. Our current RF or Voice solutions are based on out-dated technology, it is difficult and costly to maintain. How is your solution different to other mobile app development tools? Majority of solutions on the market today focus on building consumer-grade mobile app on iOS and Android based device. Our offering focuses on delivering mobile solution for supply chain and warehousing operations, for device commonly used in industrial warehouse environment, such as rugged RF handheld scanner, Vocollect talkman, as well as modern iOS and Android based device. 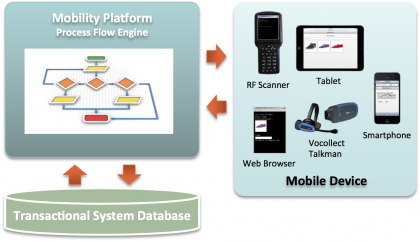 Do we need to replace our current paper-based system to get RF or Voice-based functionality? Absolutely not, whether you need to replace existing system depends on several factors, but RF and Voice-enablement is definitely not one of them. 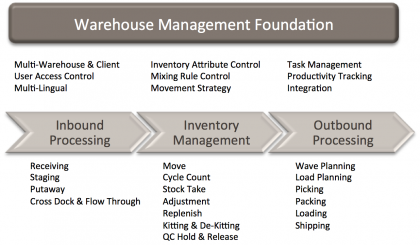 Take warehouse picking process for example, if your system is capable of producing order-based pick slip at the moment, there is a good chance Mobility Platform solution can deploy RF and Voice based batch or bulk picking functionality on top of it, such that you can start enjoying the benefit without going through the hassle to replace system. Too often customers are told to replace existing functional system just to get mobile and voice-enabled functionalities. 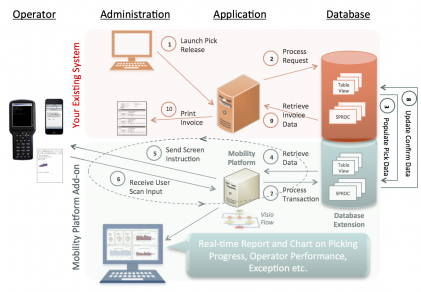 With Mobility Platform’s loose coupling architecture, customer can ‘hook-up’ existing system and build mobile and voice-enabled operation processes to interact directly with existing system’s transactional database in real-time. This approach allows customer to retain current system functionality and business logic, and only leverage Mobility Platform on the operation where mobile and voice-enablement will deliver maximum benefit to the business. Traditionally customer finds it impossible to utilise devices across functional area because they are tied to device specific program developed for specific purpose in the operation; and it is not economical to maintain multiple code-base for different types of device. Mobility Platform supports running same mobile process functionality on multiple types of device out of a single process flow code base. It can also render the display and user interaction according to each device’s specific capability, such as text to speech, touch, photo and signature capture etc. Typically multiple technical skills are required to create and maintain mobile device based application, web application and data interface program. Customers often find it challenging to obtain resource with multiple specialised skills and the maintenance cost is tremendous. Mobility Platform takes care all the ‘difficult technical skills’ behind the scene to provide customers an easy to use, easy to learn agile design framework. Business user can design and draft process and functionality on their own; and technical user can fill in the ‘programming’ using industry standard SQL and XML scripts. This eliminates the need for specialised resource and helps customers to make change much faster, which in turn lower total cost of ownership. Building anything from scratch is a lengthy and painful process, and it requires a thorough design to ease maintenance effort and to support future extension. Mobility Platform provides a comprehensive set of ready to use, fully functional warehouse management system functionalities based on years of industry knowledge and field experience. These can serve the purpose of best practice template to facilitate creation of customer specific mobile and voice operation process, or in some cases a quick extension to customer’s current system landscape. 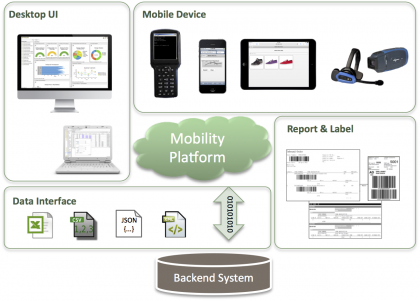 Interested to find out more about our Mobility Platform solution offering?